Comprised of two islets – Kato Koufonisi and Pano Koufonisi – this jewel in the heart of the Cyclades is the embodiment of island paradise. Tiny Kato Koufonisi is almost uninhabited, with few tourist facilities, making it a perfect exclusive spot if you’re aboard a yacht. 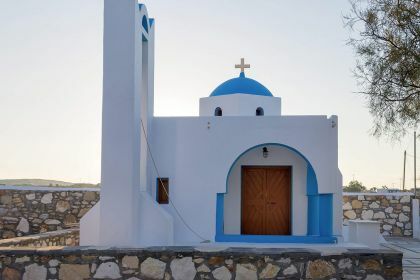 Pano Koufonisi – a recent tourism discovery – has retained all the charm and beauty of a typical Cycladic island: whitewashed buildings trimmed in blue and the most transparent, turquoise waters. Call or contact your friendly Abberley charter broker here for assistance in planning an unforgettable yachting vacation in Koufonisia and the Cyclades. The beauty about being on board your own yacht is that these two islets can be exclusively yours. Because Kato Koufonisi is undeveloped, most visitors are day-trippers from Naxos or Amorgos and don’t stay on the island overnight. This means when you’re anchored offshore in the evening, with the moon rising above you, you’ll have the whole place to. In the day, the islands offer the most exquisite beaches – white sand, crystal-clear water and craggy cliffs. And when you feel like a wander around, you’ll no doubt end up at one of the many tavernas for a delicious meal. The island’s main draw-card is its incredible water, rock pools, caves and beaches. 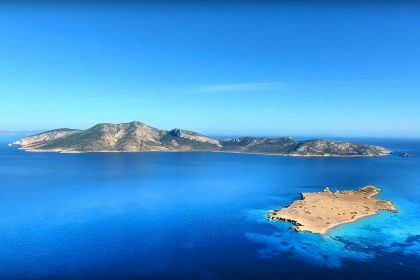 Pori Beach, with its stark Cycladic landscape, horseshoe-shaped beach and warm turquoise water is a popular spot for swimming, snorkelling and windsurfing. 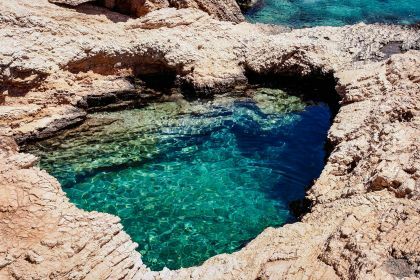 Head south towards Italida Beach and halfway there you’ll find the famous heart-shaped natural rock pool, deep enough for you to jump into. The sea caves at the southeast end of Finikas Beach don’t require scuba gear and their gin-blue water is home to octopi and a number of fish species. Most of the best dining options are found in the chora, where laidback cafes nestle next to chic restaurants. With its fresh, modern interior and friendly hosts, Gastronaftis serves delicious contemporary Mediterranean cuisine. Try the tuna tartar, lamb shank with fava puree or pork neck. For top-notch seafood dishes, head to Neo Remezzo, where the fried squid and lobster pasta are popular dishes. For more casual dining, Souvlaki Sti Strofi offers some of the best souvlakis around. Need to satisfy a sweet tooth? Fystiki has a wide selection of unusual and heavenly hand-made ice-creams in flavours such as pistachio, hazelnut and dark chocolate. Cocktails, live music and the setting sun are the order of the day in the Pano Koufonisi chora. With its soft lighting and outdoor benches, Sorokos Bar, just a few feet from the sea, is the perfect spot for a romantic sundowner. Mylos Café-Bar is housed in a whitewashed windmill and serves fabulous cocktails overlooking the marina, while Koufochorio Cocktail Bar has sidewalk tables, an upstairs terrace and a vibrant atmosphere. If you want to get a closer look at this amazing destination, contact our friendly charter broker here or by the phone. 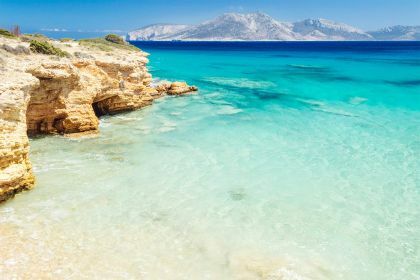 Insider Tip: If you are visiting Koufonisia off-season, most of the beaches on both islets turn into nudist spots.